This is perhaps the most optimistic time of the year. Following winter solstice, our world becomes more flooded with light by the day, and the year's giant gap between expectations and reality is being blissfully forgotten in a seasonal surge of hope for the new year. As I said before town council this past Monday, in my twelve years in Princeton, I have never seen morale among those advocating for environmental progress lower than I've witnessed this fall. Sometimes, the role of an environmental advocate can feel like that of a crash test dummy, coming hard up against an unyielding wall preventing progress, the test being to see whether we have the resilience to give it another go. Though some cynicism can leak out through the cracks, an advocate is by nature optimistic. Otherwise, why bother? There is, then, a tendency to believe we're living through the night before progress actually happens. For me, there's a bedrock belief that things will surely change soon, given how little sense the current state of affairs makes. Creation is also an act of optimism, as in my leafy takeoff on "The Night Before Christmas", reposted below from four years ago. In hopes that the street crew soon would be there. Of leaves dry and crisp, where they'd linger awhile. To such thoughts of venturing near the asphalt. That bicyclists mixed with the cars at their peril. The street drains were clogged, the rains made a river. I watched this insane spectacle with a shiver. When just down the way there arose such a clatter. I sprang to the door to see what was the matter. A caravan that was demonstrably weird. That groaned as it scooped up the leaves in great gobs. One thing that was clear was they wouldn't lose their jobs. Than neighbors dumped even more leaves in their wake. The mounds they grew higher than ever before. I guessed that our town had gone nuts at the core. How could such a state of affairs come to pass? What sense underlies this self-made morass? From yards prim and proper that so blandly merge? The leaves, they have value, it's clear, don't you see? To earthworms and robins and flowers and trees. And there place the leaves as good food for the grubs. Hidden from view they will quietly mellow. As Jefferson did at beloved Monticello. To ground they return; no need for more work. As they flatten and fade, no varmints will lurk. Let humus and nutrients there feed your soil. The mulch will kill weeds, and save you some toil. And lessen the floods that now seem to gain. Or, grind up the leaves as you last mow the grass. Okay, so it might take just one extra pass. Of all that in nature is meant to decay. That flouts local law as a matter of course. Risking taxpayer wrath of a virulent kind. As long as the streets continue to fill. This dumping is wrong. It's an ongoing blight. To all who love sense: Let's fight the good fight! Background (from original post on Dec. 14, 2011): Yesterday, a man overheard me talking to a friend at the Arts Council about all the leaves clogging the streets. He came over and said that West Windsor has the same problem, and that their town council had just thrown its hands up in exasperation, for lack of a solution to the annual deluge of leaves. The thought of towns all over New Jersey struggling with the same intractable problem, mixed perhaps with the flush of vitamins from eating swiss chard from the backyard garden, had the unexpected effect of later moving me to verse, which I read yesterday night at the Princeton borough council meeting. When faced with adversity, write a poem. By coincidence, The Claw came by our house as I was writing it. My apologies to Clement Clarke Moore for rerouting his 1822 "A Visit From St. Nicholas" down a very messy street. Why Did the Leaf Pile Cross the Road? Here's an idea for freeing up 720 hours of public works staff time, equivalent to $20,000 in the municipal budget every year, while benefitting local businesses and actually improving service. For years, Princeton has been giving away leaf bags in the spring and fall. It sounds like a good program--a way to encourage homeowners to containerize their leaves rather than pile them in the street where leaves can be an environmental and safety hazard. Each resident can get as many as 40 bags per year at no cost--a nice perk. But how does this program actually play out? The bags are stored in this shed near Community Park Elementary. Within the shed, eight hours a day, five days a week, 18 weeks a year, sits one or another of our full time public works department employees. At $30/hour, including benefits, that works out to more than $21,000 per year spent to man the shed. A staff member told me that they do no work other than to wait for a resident to come along to take some bags. (Note: Senior staff later stated that staff in the shed also perform other duties, though it's not clear what.) Some days, 25 residents may show up, but on rainy days, nobody comes. This past year, according to data provided by staff, 13,200 bags were distributed, purchased for $0.40 per bag. The $5280 cost for the bags was paid through a Clean Communities grant, but the staff cost to sit in the shed comes to $1.60 per bag. That means Princeton is spending $2 to buy and distribute each bag. For contrast, leaf bags can be bought at Ace Hardware in the Princeton Shopping Center for $0.50 each. The "free" leaf bag program, then, turns out to be a costly way of dispensing leaf bags. The 20 bags in this photo provide a much neater way of dealing with leaves than piling them loose in the street, but they also represent a $40 subsidy by the municipality under the current program. An alternative approach, which would free up those 720 hours in staff time for other work, would be to have a local business stock the bags. The local hardware store, for instance, could serve as the outlet, tracking how many bags it gives out and to whom. The municipality would then reimburse the business, at a quarter of the current per-bag cost. Unlike the town's shed, local businesses are open on weekends, when homeowners are most likely to want the bags. One store manager responded favorably to this idea. A way to save even more money would be to shift away from subsidies of one-use bags. As the Princeton Environmental Commission has pointed out, paper bags require even more energy to manufacture than plastic bags. The paper mill I studied during an environmental field trip to Savannah, GA in the 1970s polluted the air for miles around, and lowered the water table to dangerous levels that invited saltwater intrusion and left other people's wells dry. Paper is no great gift to the environment. In addition, the leaf bags are hard to fill, get wet in the rain, can be too heavy for our less muscular residents to haul around the yard, and are unstable if not set very carefully at the curb. This is not an argument for discontinuing the leaf bag collection, but brings into question the investment in a public subsidizing of their use. Fortunately, there's a better approach used in many other municipalities around the country. This past year, I worked with town staff, a town council member, and members of the Princeton Environmental Commission to develop a proposal to try compost carts for leaf and yardwaste collection in one of Princeton's five "zones". This sort of cart is used in Princeton by cost-conscious and service oriented private companies like Waste Management to collect recyclables downtown and at local schools. A small 32 gallon version of a compost cart is used to collect foodwaste from participating residents. 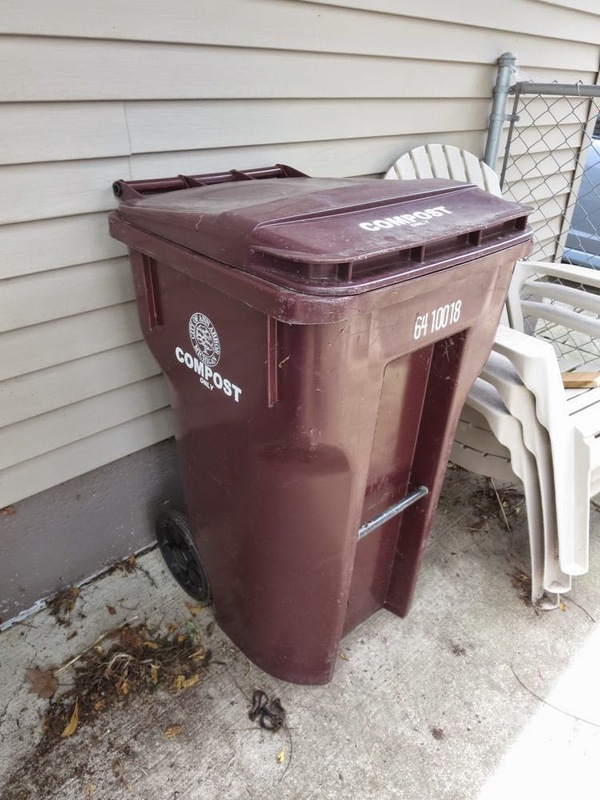 Since a 64 gallon compost cart, such as the one in this photo, would hold the equivalent of three leaf bags (each bag holds 30 gallons, but most people fill them only to 2/3rds full or even less), each filling of a compost cart by a resident is equivalent to a $6 savings in municipal bags. Over the course of a 26 week pickup schedule, the compost cart could handle the equivalent of $150 worth of the town's leaf bags, while costing only $35 to purchase. Over the course of a ten year lifetime, that investment of $35 to buy the compost cart yields $1500 in leaf bag equivalent benefit, for each participating resident. Even if the typical resident wouldn't use a compost cart every week, that's a serious perk for homeowners. In addition to their potential for providing great benefit at low cost, compost carts are easier to fill, easier to move about the yard, easier for crews to empty. They keep the contents dry and can last for decades, and have been successfully deployed by many municipalities elsewhere in the country. The proposed pilot program that we worked hard to develop would have given residents a chance to try compost carts and discover their benefits. Since the carts would be emptied by the same truck that picks up leaf bags, there would be no extra ongoing cost to using them. Startup costs would be $5000 for a "tipper hook" retrofit on an existing truck, and $3500 for the first 100 compost carts. Though leaf bags and loose leaf pickup would continue, the use of compost carts could expand until residents would find that they can easily deal with their leaves with a combination of carts and backyard composting, steadily reducing the need for the more expensive leaf bag and loose leaf pickups. Princeton will eventually discover that adding compost cart service is the best way to save money while providing greater convenience and consistency in service, but resistance to trying new approaches is greatly delaying progress, and is keeping Princeton from being a leader in NJ, where so many towns are struggling with the same issue. Even the modest proposal for a pilot program, refined during meetings over the course of a year, was voted down by the solid waste committee, before a case for its adoption could be made at a public meeting. You can see why so many environmentalists in town are feeling exhausted. At least the free leaf bag program shows promise of being amended. My presentation to town council on Nov. 23, 2015, and council members' response, can be found at this link, between minutes 18:45 - 22:55.